Paula Slier, an RT reporter, was caught in tear gas in Istanbul as riot police attempted to disperse a protest at the authorities’ ‘take-over’ of the opposition outlet Zaman. Police also reportedly launched water cannons and fired rubber bullets to disperse the 500-strong crowd. "Police used very heavy tear gas, it was a peaceful protest," people outside Zaman's offices told Slier following the deployment. 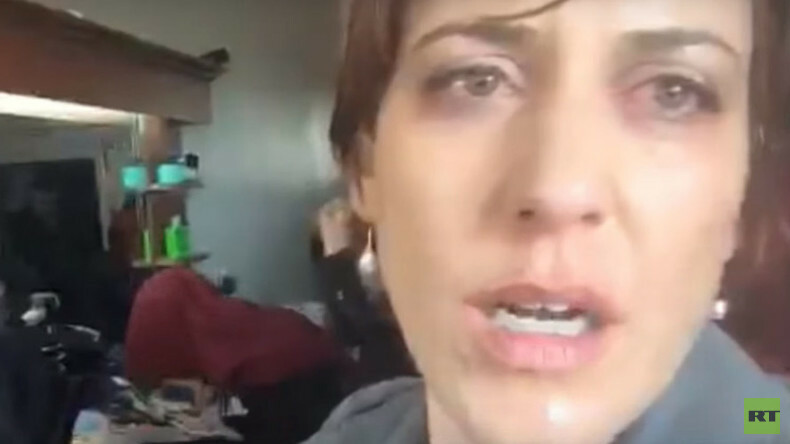 “Last 10 minutes or so we’ve been heavily teargassed, so we ran for cover and ended in a near-by hair salon,” Slier said in her Periscope feed. "People all around are wiping their eyes, some are sitting on the ground trying to recover," she added, showing images from the scene. “The protest was quite peaceful. Suddenly police advanced and within moments the police started stampeding and throwing tear gas canisters. Everybody started running. I got caught up amongst a women’s group and some of them went to a barber shop, where people are trying to recover, myself included,” she said. Police also fired rubber bullets, an AFP photographer at the scene reported. Injuries have reportedly been sustained. "We were just protesting the situation peacefully, there wasn't any warning from the police when they started heavily using tear gas," a red-eyed man told RT's reporter, adding: "We are not against our nation or our state, but we have the right to protest the illegal seizure of the newspaper." Friday, a board of trustees was appointed to the media group by a court order. The board fired the media group’s editor-in-chief, Abdülhamit Bilici, Today’s Zaman, an English-language newspaper, reported on Saturday on its Twitter. The daily also said that all internet connections have been cut at their headquarters and removal of web content is underway. Internet connection gone. Passwords do not work, our access to system is blocked. Thats what happens when govt seizes a newspaper. "I am here to support Zaman. They can seize Zaman from our hands, but they cannot take it from our hearts. They cannot shut us up," a woman outside the newspaper's offices told RT. Overnight, police used water cannon and tear gas to disperse the crowds. After clearing their way to the front of the newspaper’s HQ, the officers continued into the building. The journalists allegedly couldn’t get access to their offices and were forced to hand over their cell phones to the police. Ankara's appointments to the media group (including the flagship Zaman newspaper in Turkish and English-language Today's Zaman and Cihan agency), have been criticized in the country and by a number of international organizations. The general consensus is that the actions taken against the media are a fresh attack on opposition in Turkey. "This is the latest episode in the long-standing attacks on media freedom and the freedom of expression in general in Turkey," Amnesty International’s campaigner for Turkey, Milena Buyum, told RT. The human rights NGO said the situation is "deeply troubling amid the Turkish authorities’ ongoing onslaught on dissenting media." The US State Department also called Ankara's actions "troubling." President of the European Parliament, German politician Martin Schulz said he intended to raise the issue at the upcoming EU-Turkey summit on Monday. "The Istanbul court's decision to appoint trustees to run Zaman newspaper and other media is nothing but a veiled move by the president to eradicate opposition media and scrutiny of government policies," Human Rights Watch (HRW) senior Turkey researcher Emma Sinclair-Webb said, adding, "The government should immediately reverse the action." Leader of the main opposition Republican People's Party (CHP), Kemal Kilicdaroglu, said the court's decision was in the interests of the ruling party and President Erdogan. "The decision to appoint trustees was made by a group of judicial bodies to serve the expectations and the ambitions of the AK Party and the presidency," he said, adding, "all disserting voices" in Turkey are labeled as "criminal organizations" by the government. A petition to "end Turkey's crackdown on press freedom" has been launched online. So far it has accumulated over a thousand signatures.